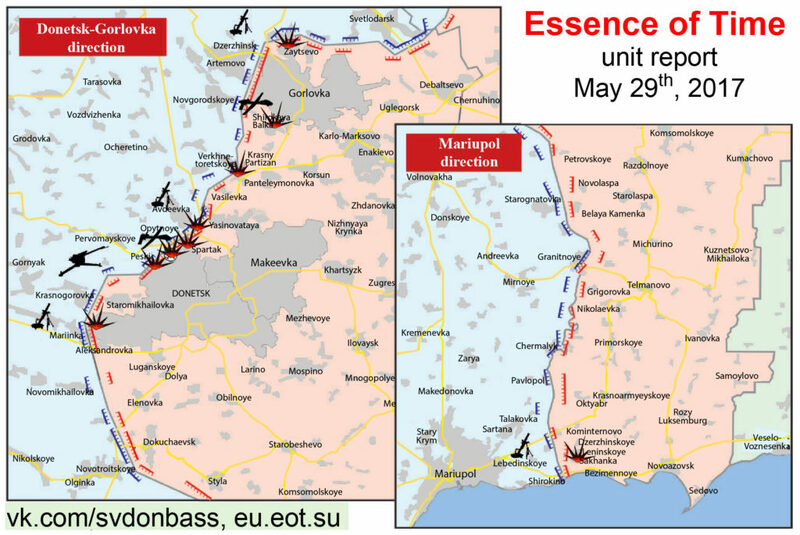 On the Gorlovka and Donetsk directions, the Ukrainian army shelled the front-line territories of the Donetsk People’s Republic (the DPR); the enemy conducted aerial recon with drones, a source in the Donetsk People’s Republic People’s Militia (the DPR PM) informed a Rossa Primavera News Agency reporter on May 29. On the Gorlovka direction, the villages of Zaytsevo, Ozeryanovka, and Krasny Partizan came under Ukrainian army’s fire. Ukrainian drones conducting aerial recon were noted in the southwest of Gorlovka. On the Donetsk direction, the Ukrainian army shelled the area of the “Yasinovataya” checkpoint, Spartak, the area of the former Donetsk airport, the outskirts of Volvo-center, and the village of Trudovskiye with 122mm and 120mm mortars. Ukrainian reconnaissance drones were active in the north of Donetsk. According to recent information, on May 28, the Ukrainian army violated the ceasefire 68 times while shelling 19 communities of the Republic. As a result of the shelling, 9 houses were damaged in Staromikhaylovka, Zaytsevo, and Dokuchaevsk. There is no information about victims and destructions. This entry was posted in News from Ukraine and tagged Classical War, DPR, Shelling, Situation report, Ukraine, Violation of Ceasefire. Bookmark the permalink.